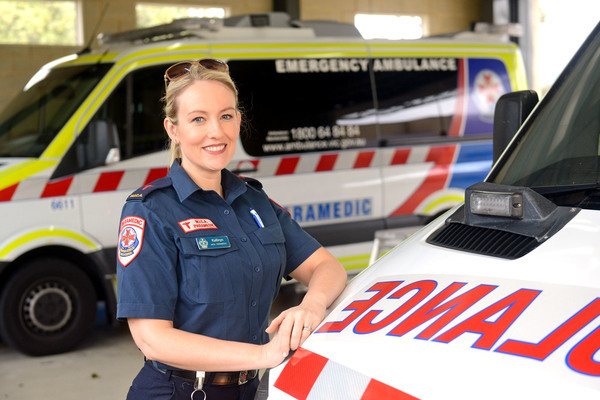 Narre Warren paramedic Kathryn Eastwood was recently awarded the 2019 Ambulance Service Medal. 190040_01. Narre Warren paramedic Kathryn Eastwood was awarded the 2019 Ambulance Service Medal. Dr Eastwood has had a distinguished career in paramedicine, breaking new ground for paramedics. The award was established in 1999 as a way to recognise the distinguished service of men and women within Australia’s ambulance system. Ambulance Victoria CEO, associate professor Tony Walker said Ms Eastwood had made a significant contribution to paramedic education and research, developing and delivering educational material for paramedic courses primarily in the area of anatomy, physiology and paramedic practice. “She developed and coordinated the cardiac intensive care unit for the postgraduate MICA paramedic course, which is the cornerstone for the MICA course,” he said. Dr Eastwood has been with Ambulance Victoria since 2000. She was the first paramedic to complete the Master of Emergency Health (MICA paramedic) degree and her research into mathematical capabilities of paramedic students has impacted on patient care, improving the skills of paramedics to ensure appropriate drug administration practices. She was awarded the prestigious Australia Postgraduate Award scholarship to undertake her PhD. The PhD research into Ambulance Victoria’s Referral Service resulted in the expansion of Ambulance Victoria’s international profile, allowing evidence-based research to highlight the operational structure and service delivery models used in the state. “I am extremely proud of the work of all of our award recipients,” Mr Walker said. While continuing her work as a MICA paramedic, Dr Eastwood also holds a Health Services Research Fellowship at Monash University. Next articleHave you seen Kenneth Richardson?